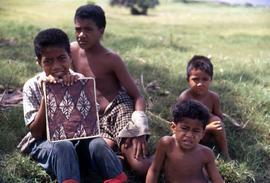 Colour Kodachrome 35mm slide depicts a group of boys just wearing lava-lavas. Colour Kodachrome 35mm slide depicts a group of boys sitting on a green hill. Colour Kodachrome 35mm slide depicts a group of children in Bratsk.Note for slide reads: "Happy youngsters. Gave them gum." Photograph depicts two men and a boy. Written on verso: "Avram Nevo - Shaliach, Simcha - Madrich from Winnipeg." Black and white image of Harry Seidelman with the Mallek boys. B&W print depicts three unknown boys running around a race track. "High School Sports" is written at the bottom of the image. B&W print depicts unknown boys running around a race track. "High School Sports" is written at the bottom of the image. B&W print depicts a young Irving Snider posing on the porch of his home. "Home" is written on the bottom of the image.Note: colour adjusted on jpg. B&W print depicts two unknown boys in their bathing suits standing on rocks. "Horseshoe Bay" is written along the bottom of the image.